This is a deep dive into the yield keyword in C#. At the surface yield is a keyword that allows a method to return an iterator (IEnumerable, IEnumerator, IEnumerable<T>, or IEnumerator<T>). When the caller uses the iterator (say in a foreach loop) the iterator will only call as much code as needed to get to the next item. This is all well and good, and the above information with a few code samples is ample information for many programmers to go off and use iterator constructs without needing to know much more. However there are still questions that are left unanswered with the simple introduction. Looks like there is ‘yield return’ and ‘yield break’ what is what and when would I use one over the other? How exactly does the runtime know the state of the iteration? There are other questions that may be lingering, but hopefully by just exploring the large questions there is an ‘ah ha’ moment that makes the answers to other questions easier to come by. Lets start with the easy one. The two forms of using yield are ‘yield return’ and ‘yield break’. You want to use yield return to return the next value in the iterator, and yield break to stop the iteration. Take a simple example of a none iterator. If we did not use ‘yield break’ and left the ‘return’ statement the compiler will give you a friendly error message “error CS1622: Cannot return a value from an iterator. Use the yield return statement to return a value, or yield break to end the iteration.”. Hopefully by now how to use yield is clear, even if why you would use it and how does it work is not yet. Lets explore the 2 example from above for a little longer. First of all both examples can pretty much be used inside your code interchangeably. Both take in range and return an IEnumerable that can be used in a foreach. The difference is the first example (the one without the yield) will construct a whole list in memory before returning it. We can see this by using ildasm.exe and inspecting the method. Don’t worry if you are not to familiar with IL. I’ll call out some of the important bits. First thing to notice is that it is 53 instructions. 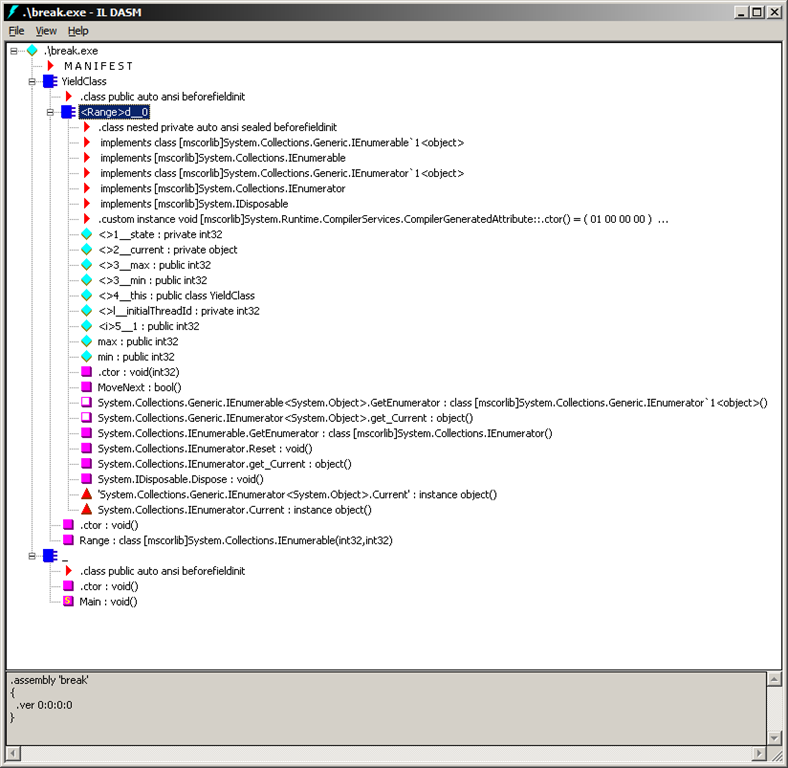 Instructions from IL_0000 to IL_000f are the precheck if min is greater than max and returns a new empty List. The rest of the program starting from IL_0011 creates a list and adds an integer to the list (IL_001d) this repeats until all the integers from min to max have been added to the list. Then the list is returned as an IEnumerable. Calling a method this way for a min and a max close to each other would work pretty well and not take up too much memory. However if min was Int32.MinValue and max was Int32.MaxValue you could easily run out of memory. Using an iterator construct would prevent the memory use problem by only returning values as needed. This keeps a small memory foot print, but how does the CLR know what to return next? 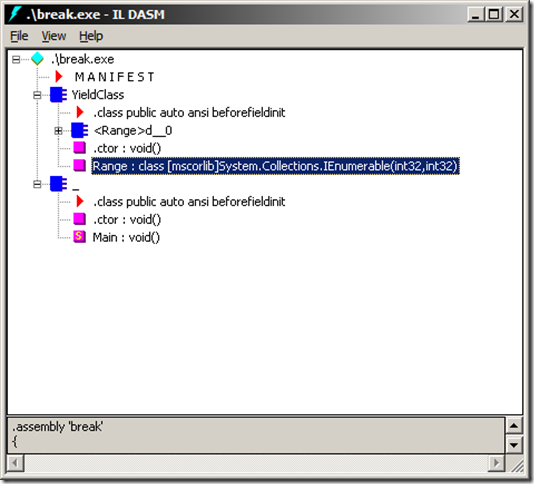 Lets take a look again at the dissembled source using ildasm.exe. 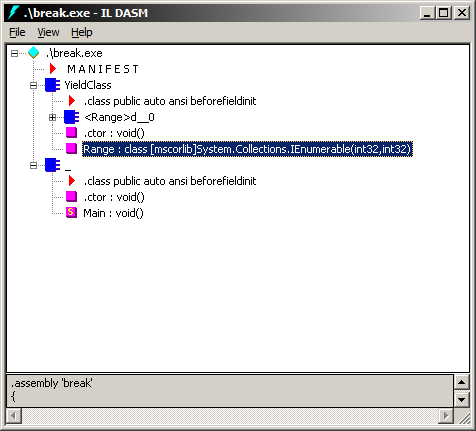 Notice how <Range>d__0 is an embedded class under YieldClass. I'll repeat that. The C# compiler just generated a full blown class for us under the covers when we used the yield statement. Back to the IL, we can see on line IL_0002 we are creating a new instance of <Range>d__0 then lines IL_000a, IL0011, and IL0018 we just set the <>4__this, <>3__min, and <>3__max fields on the <Range>d__0 class. Then it returns the instance we created. This starts to shed some light onto how the state is being managed, but it doesn’t really answer the question on how exactly the runtime knows the state of the iteration. For that we will need to dig into the <Range>d__0 class. Expanding the class in ildasm we can see there is quite a bit inside. It implements a bunch of interfaces, it has some fields, some of which we saw being set before when we looked at the IL for our function and it has functions and properties (all of which are actually part of one interface or another). To actually dump out all the IL that gets generated for the class would be unwieldy. I recommend making a simple program and start poking around the IL as I point out some of what is going on. The first thing to know is how exactly an IEnumerable get called in an foreach loop. The C# compiler does a bit of magic. Basically the foreach statement calls MoveNext until there is nothing left to enumerate over. Looking at the IL for the MoveNext function in the <Range>d__0 class one of the first things is a jump table implemented via the switch opcode, which is just a jump table. The input to the jump table is the <>1_state (which if you did into the constructor for <Range>d__0 the state field was initialize during creation of the <Range>d__0 class. The state that is stored is actually the which part of the code we are currently executing. That is, the more ‘yield’ statements we have, the more states we will have and the more entries we will have in our jump table. Now we are getting somewhere! We know how the runtime know which part of code it needs to execute, but now how about the currently value. That is taken care of by the <>2__current field. This field will store whatever value the enumerator is currently pointing to. Then each target in the jump table can use the current value (if needed) to compute the next value. Hopefully this has demystified some of the magic behind one of the neater C# features. To really understand more I do highly encourage breaking out ildasm to and actually follow along with what was generated to allow your C# program to do the cool things its can do.